We know how stressful and tough it can be to find someone to watch your feathery, slithery or furry companion. Especially if it is last minute! With 20+ years of experience boarding and giving advice for pets, we understand the needs of you and your pet. Local Pet would love to watch them while you are taking care of those extra busy moments in life. 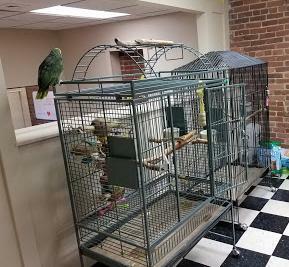 We offer boarding for any domesticated bird or parrot. From canaries up to cockatoos. Tonto, our Mexican Double Yellow Head enjoys the extra company! 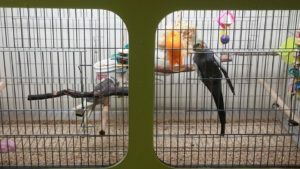 Caging is available for birds, parrots (canaries up to cockatoos), and small animals (guinea pigs, chinchillas, and rabbits). You are welcome to bring your own cage and special diet/snacks. Otherwise, we provide food at no extra cost. Reptiles, amphibians and small animals (hamsters up to rabbits) can be boarded here too. If you check our Facebook page, you can see the owner Brad enjoying the company of our boarders. Small animals (hamsters/gerbils), reptiles and amphibians we do not have caging available but have space available for their current cage/terrarium. (Currently no storage for frozen food.) If you have other species that are not mentioned, contact us and we will do our best to help or make accommodations. If you have any questions or would like to reserve a spot (Please give 48-72 hour notice), feel free to call us at (412) 404-7273. Q: What do you charge for animal boarding? Q: Should I bring my animal’s cage for their stay? A: We understand that sometimes their cage is too difficult to move and we try to provide a suitable area for your pet during their stay. We have plenty of cages for small up to large birds (canaries up to amazons). XLarge birds (cockatoos/macaws) we have one large cage available next. As for small animals (hamsters/gerbils), we do not have cages for and require that you bring your current one. Medium animals (chinchillas/guinea pigs/rabbits) we have two cages (16″H x 19″W x 31″L and 15″H x 14″W x 25″L) but you are welcome to bring your own cage. Reptiles and amphibians we do not have terrariums and require that you bring your current one. We do appreciate a 48 to 72 hour notice if you plan on boarding with us. That is so we can prepare an area for your pet and know if we have the appropriate housing as well. Q: Can I bring my pets favorite snacks? A: Yes and we also have a small fridge that can accomodate items that may need refrigerated. Just make sure they are in a sealable bag or container to help keep freshness. Q: Do I need to bring my pet’s food? A: We recommend you bring your pet’s food if it is a special diet. We have food available for birds , small/medium animals (ZuPreem, Sunseed, and Oxbow). We do not have food available for amphibians and reptiles but we are capable of handling the insects that you bring.